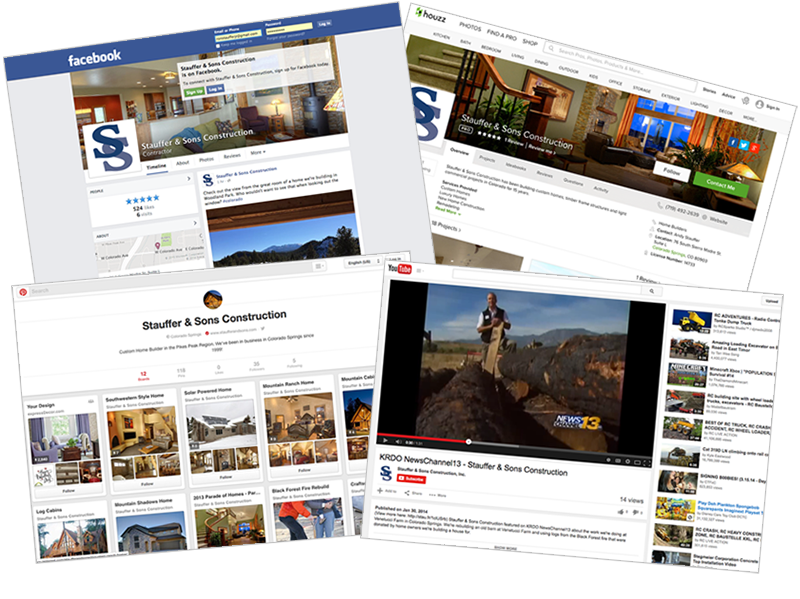 Yesterday, I gave a presentation on social media at the Colorado Springs HBA’s Remodeling Council. I was asked to give a talk about the topic since social media seems to be a nebulous concept for many in the building industry: builders and remodelers know they should probably be using it, but they’re not sure which social networks are the most important, or how to use them. The sheer number of social networks can be overwhelming. Don’t worry about that—just start small. Facebook: Just about everyone knows about it, it has over one billion users, and most likely all of your clients are already using it daily. Pinterest: This is a great place to share photos of your work, since people can save (“pin”) your photos for the future. Share your best photos here. Houzz: Similar to Pinterest, but directed specifically towards consumers wanting to remodel or build. Make this a high priority for your business. Google+: Google’s (newest) attempt at a social network. It’s worth evaluating since it may impact search rankings now and even more in the future. YouTube: If you have any videos of your company, you should post them here. Twitter: This is a great social network, but you’ve got to be quick and to the point (you only get 140 characters per “tweet”). LinkedIn: Great for personal branding. If you haven’t already filled out your profile to 100% completion, you should do this right away. Yelp: A review site where people may already be talking about your company—check your profile to see what they’re saying, and respond as needed (politely!). Porch: This local directory-style social network is also affiliated with Lowes, so it’s worth paying attention to if you’re in remodeling. Vine: You can post very short (about six seconds long) videos here. Instagram: This photo sharing service is only an app (no website) and is hard for businesses to use. It’s not nearly as big a priority. Snapchat: This “disappearing photo” social network can be a very low priority for most brands. It needs to have an audience that includes your potential clients (hint: think big!). It needs to allow you to show off what you do best (hint: photos are great in our industry). It needs to be something you can focus on naturally, without expending too much time or thought. For companies that build homes, most potential clients want to see photos of the homes you build. That’s pretty obvious. And for remodelers, it’s arguably more important, as potential clients want to see before and after photos. So it stands to reason that the most important social network to focus on would be Facebook, since it fulfills all three of the criteria mentioned above: it has the highest amount of users so the odds are your potential clients are using it; it allows you to share photos of your work; and it’s very easy for most people to use since they already have a personal profile. So if you’re not using Facebook for business, I highly encourage you to create a business Facebook page today and start using it. After Facebook, determining where else to focus becomes a matter of asking yourself how much time you’re willing to spend on updating your accounts, how many people you can connect with, and what kind of content you have that you can share. Theoretically, you could spend all day, every day on your social media accounts, and some brands have hired people (and even entire departments) full-time for this purpose. For most small builders though, it’s just not economical, so it’s often the business owner or a manager who has to do this, at least to start. Even so, I recommend that they give social media a try by starting small. Set a goal to start posting photos to Facebook once a week on the same day, Wednesday for example. Try that for a few weeks. Then create a Twitter account and tweet out what you’ve recently posted to your blog. Then add a video to YouTube and share a link to it on Facebook and Twitter. Then start creating photo albums “Pinboards” on Pinterest and watch as people start to “re-pin” what you’ve posted. Eventually, you’ll start to get the hang of how it works, and you’ll start to find out which social networks you like best or get the best response with. Listen more than you speak (just like in real life!). Try to share high-quality content. If you’re posting photos, share professional-quality photos. If you’re posting videos, use a microphone and a tripod. Connect with the people and brands you already know and interact with “in real life”—this is a great way to get started and will jump-start your understanding of how to use the system by looking at how others are using it. Create (or claim) a profile on every social network you can find. You don’t need to actively use all of them, but create an account for your company with at least your contact info, logo, etc. Every few weeks, look back at what you’ve posted and see how it is (or isn’t) working. Find out what people are liking, sharing, commenting on, etc, and use that feedback to help you determine what to post in the future. Keep it positive! Just like in real life, people are interested in having positive conversations about great things that are happening. Social networks are not a good place to badmouth others or point out the weakness of your competitors. If you’re already using social media for your business, great job! Keep up the good work. If you’re just getting started, don’t fear—it’s not as hard as it might seem, and it is worth the time and effort. You’ll get the hang of it. All you have to do is just get started and it gets easier from there. Good luck!